In what was once an outdated and underutilized sports book space, William Hill and The Plaza are proving that anything that’s old can be new again. 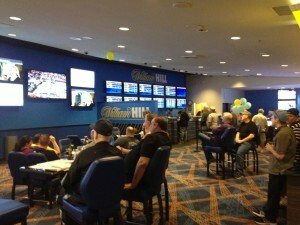 William Hill, which took over sports book operations at The Plaza many months ago, has transformed the sports book area with a modern and unique layout that is much improved from the former set up of one of Sin City’s oldest operating sports books. The Plaza sports book is also the largest amongst Fremont Street properties. Even though there are no jumbo-sized screens, new high definition flat screens abound (75 to be exact) making sports viewing a breeze from any seating area within the sports book space. There’s definitely new life in the place, with a set up that reminds one more of a lounge than a typical sports book. Although the sports book at The Plaza is tucked away at the south end of the casino, there’s plenty to like as the very tasty Pop-Up Pizza is directly adjacent to the sports book and the nearby bar serves up $2 Dos Equis – perhaps you can be the most interesting…never mind. On top of all this of course are William Hill’s favorable odds on everything from future bets to teasers (the 3-team, 10-point NFL teaser at -120 offered by William Hill is certainly an interesting play). The revamped sports book at The Plaza certainly gives other Downtown Las Vegas properties a run for their money as it one of the nicer sports betting and viewing options on Fremont Street.